book seven, I’m rereading book six. Not everyone is a fan of Harry Potter. Though today, you’d be hard pressed to find too many who haven’t at least seen a movie or read a book. 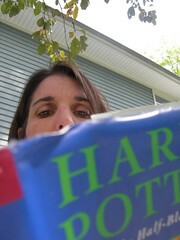 What makes this moment significant, though, is the scale of HP’s entrance into our popular culture. Like the Beatles did for pop music and Star Wars did for the movies, Harry Potter will go down as the most powerful literary phenomenon in our time. Friday night will be an international party as the seventh book is released. Fans are already figuring out ways to avoid the Internet, magazines, television news and friends who might spoil the greatly anticipated ending to the series. In the homeschooling world, much has been written about the dangers of the books versus their delightful and engrossing plot-lines. No matter where you fall in that debate, we all can see that Harry Potter and his magical world have invaded our international consciousness, have created a memorable cast of characters whose names are now synonymous with the character qualities they represent, and have engaged children and teens in their first most delicious and satisfying book discussions many of them have ever known. They have discovered that books are more than stories to be read and finished. They are to be savored, analyzed and enjoyed with fellow readers. To that end, we will open a discussion forum some time in August (depending on when I finish the book!) for any teen or child (or enthusiastic parent!) who wants to have a place to discuss the series with fellow fans. It will be supervised (by Jon and me) requiring a log in, but for no fee (free of charge). This entry is filed under General, Literature. You can follow any responses to this entry through the RSS 2.0 feed. Both comments and pings are currently closed.